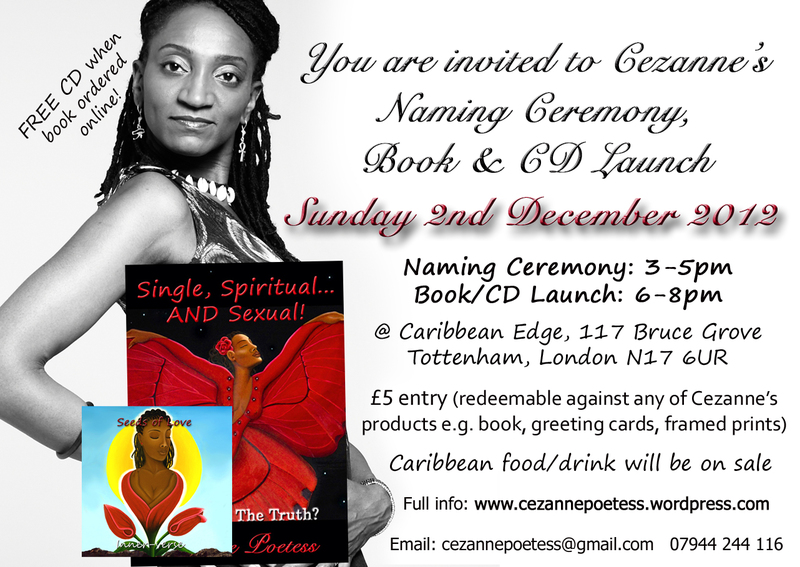 Invitation to Cezanne’s Book/CD Launch Sunday 2nd Dec 2012 | "Join me on 'the journey' of self Discovery!" Is it possible to be Single, Spiritual…AND Sexual? Join us as we explore this question at the launch of my new Self-help novel ‘Single, Spiritual…AND Sexual!’ on Sunday 2nd December from 3pm! The event will be hosted by El Crisis. BONUS OFFER: FREE Seeds of Love CD! My (re)Naming Ceremony was meant to be taking place on the same day, but I have decided to postpone it until the Spring of 2013: I am taking an African surname in honour of my ancestors who were stripped of their names and given their slave master’s names. According to my story (not his-story) ‘as long as we (descendants of the enslaved) still have our slave master’s names, they still have a spiritual hold over us’. I am in the process of changing my name by Deed Poll and want to give the event the attention it deserves on its own. No need to cook – Caribbean food and drink will be on sale! ← Paperback Now Available, Read the First Chapter FREE!